The intraosseous access device (IO) has been a lifesaver by providing vascular access in patients who are difficult IV sticks. In some cases, it is even difficult to draw blood in these patients by a direct venipuncture. So is it okay to send IO blood to the lab for analysis during a trauma resuscitation? Bottom line: Intraosseous blood can be used if blood from arterial or venous puncture is not available. Discarding the first 2cc of marrow aspirated improves the accuracy of the lab results obtained. The important tests (hemoglobin/hematocrit, glucose) are reasonably accurate, as are Na, Cl, BUN, and creatinine. The use of IO blood for type and cross is not yet widely accepted by blood banks, but can be used until other blood is available. NOTE: your lab may try to refuse the specimen due to “other stuff” (marrow) in the specimen. Have them run it anyway! Reference: A new study of intraosseous blood for laboratory analysis. Arch Path Lab Med 134(9):1253-1260, 2010. Serial Hemoglobin To Monitor Chest Tube Output? Huh? I’ve already written about the (f)utility of serially monitor hemoglobin (Hgb) or hematocrit (Hct) levels when managing solid organ injury nonoperatively. 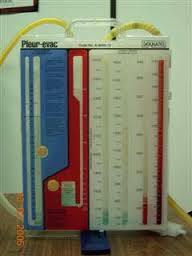 What about if you are concerned with bloody output from a chest tube drainage system? Could it be of any use there? What is the Hgb or Hct of the fluid coming out of the chest tube? At worst, it will be the same as the patient, assuming that pure, whole blood is coming out. But this is seldom the case. The fluid is usually described as “serosanguinous”, which is not very exact, but tells you that it is thinner than blood. And if it looks more like Kool-Aid, the concentration is very low indeed. What is the volume in the container? Most collection systems will collect a maximum of 1 to 1.5 L of juice. How fast is it coming out? These things almost never fill right in front of your eyes. It’s a slow process, with less than a few hundred ccs per shift. Here’s a few hundred ccs of thin drainage in a collection system. Probably decrease in Hgb value – < 0.1, which is far less than the range of lab error. Bottom line: So now do the math. Let’s say the fluid has half the hematocrit / hemoglobin of whole blood. Losing one unit (500cc) of whole blood will generally drop your Hgb by about 1 gm, or your Hct by about 3%. If the blood is half-strength like I am proposing (and the usual drainage is typically much thinner), it will take twice as much (one liter) loss to drop the lab values by that much. This will probably come close to filling up the average collection system. If it takes a day or two or more to fill up, you are not going to see much change in their lab values. And most of the time, the blood in the system is thin like Kool-Aid, so your patient is really losing very little actual blood. So measuring serial hemoglobin / hematocrit as you watch a hemothorax drain doesn’t make sense. Unless the output is pure blood and the system is filling up in front of your eyes, of course. In that case, a trip to the OR to fix the problem might be a better idea than doing a blood draw and sitting around waiting for the result to come back. Serial hemoglobin / hematocrit in solid organ injury?